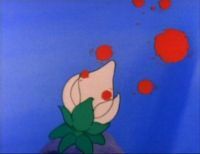 A Lava Lotus is an artificial flower that lives underwater in Super Mario Bros. 3. They are capable of creating and storing lava balls under their transparent leaves and attack by opening up to release them. The fireballs can go through platforms and make navigating underwater difficult. The number they shoot out is random and can be up to five at a time. The fireballs travel rather slowly and in a straight line from their point of release. They can only be defeated by Hammer Mario, Hammer Luigi, or a Starman. 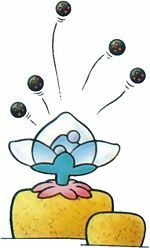 Lava Lotuses were given a land counterpart, the Volcano Lotus, in Super Mario World, which did not feature Lava Lotuses. They had a very similar attack pattern, but they were terrestrial instead of aquatic. These Volcano Plants also appeared in Super Princess Peach, leaving Lava Lotuses with only one game appearance (not including Super Mario Bros. 3's reissues). A single Lava Lotus appears briefly in The Adventures of Super Mario Bros. 3 episode "Oh, Brother!". This Lava Lotus unleashes its fireballs on Frog Luigi, who manage to swim past them with ease. In the Nintendo Adventure Book Dinosaur Dilemma, Mario avoids some Lava Lotuses while collecting coins in Lake Trilobite. According to Nintendo Power, Lava Lotuses have a relation to Piranha Plants, despite not being listed as such in the original instruction booklet. Suichūka Refers to a type of artificial flower which "blossoms" in water. ↑ "An artificial flower that grows and blooms deep in the sea. Look out for the lava balls that it will release." - Super Mario Bros. 3 English instruction booklet, page 36. ↑ "An aquatic relative of the Piranha Plants, the Lotus spits fiery lava bits." - Nintendo Power Volume 13, page 9. ↑ Super Mario Bros. 3 Japanese instruction booklet, page 37. ↑ Super Mario All-Stars - 25th Anniversary Edition Italian instruction booklet, page 28. This page was last edited on March 27, 2019, at 17:03.